First I am not working for, sponsored by, hold stocks in or getting paid by Wicked Edge for this review, I bought my Wicked Edge with my own money. Second I own or have used a few different knife sharpening systems, Scary Sharp, Lansky, DC4, Spyderco Tri Angle Sharpener, Razor Sharp, and a bunch or both water stones and oil stones. Third I make knives and sheaths, and sharpen a restore knives, so I have a little experience with trying to get a good edge on something. Forth, Terminology: this model is called the Wicked Edge Model WE50 Go, I will just refer to it as the go; Wicked Edge is the company - I will probably call them WE, the artificial diamonds it uses are bonded onto metal plates adhered to paddles, I will try to refer to them as paddles as they are NOT stones, although I may occasionally bugger up and call them stones; grit and micron are both outdated and incorrect methods of describing how fine the scratch patterns on the metal made by the diamonds are - but I will use the term interchangeably because people tend to understand them, I will probably use git occasionally, you know what I mean. I bought my go off of the NZ dealer for Wicked Edge Paul Davis, who is a nice guy to deal with, he has a website called Bladenz, again I am not associated with him and I paid full price for my products. I bought the go which comes with two double sided paddles with 200 grit diamonds on one side and 600 grit on the other, two guide rods, one clamp, one allen key, one screw to hold the vice, one vice, one base, one depth key, one sharpie style pen (which was broken, one set of instructions and one rather nice bag that the whole system folds up into, in fact most of the components slot into the base, which is good for transport - hence there name Go. In addition I also bought the following, which are not needed but I find useful as a knife maker: an angle cube, two extra double paddles, one with 800/1000 grit and one with 3 micron (roughly 7000 grit) on one side and the other side a blank piece of glass which I glued diamond lapping oil from wicked edge on to at 1.5 microns (roughly 14500 grit), an attachment to sharpen scissor and chisels and an attachment to do ultra low angles on. I do intend to buy a few more odds and ends as well. The go is the cheapest and newest model made by WE, some of the other models are ridiculously expensive, and as I was not sure whether I would like the system I wanted to go cautiously, (although the comments are interchangeable so if I want to upgrade I can use my existing stuff. Essentially you unwrap it, put it together, clamp it to a table, put the knife in the vice, set your angles, put the paddles on the guide rods and go to work. The vice on this model operates from the side, meaning that one bit moves and the other bit is stationary, this will throw out the the angle off one of the knife bevels slightly, so I use the angle guide to set both angles exactly (the Scary sharp has a better vice in my opinion), the vice will scratch your blade slightly so if fussed you can put a piece of tape or chamois down to protect your knife (next time someone bags a chamois I will swap a free knife sharpening for a bit of chamois...), once clapped in though the blade stays pretty stable, long flexible blades like a filleting knife will need a bit of adjustment to get the least amount of flex. The are two guide rods so you can sharpen both sides at once, this I feel crashes a better edges than the Scary sharp or the Lansky where you can only do one side at a time, it save time but it also feels like you get a more even edge as the wire edge tends to get broken off as it forms (the burr). You can either replicate the existing edge, in which case unless you are removing chips or damage I would stick to the 600 grit paddle or higher, if you are reprofiling the bevel angle our fixing damage then you go with a lower grit paddle - you can buy a 50/80 grit one but I imagine thats really harsh. However they are really really sharp, and I can see once I have the stones broken in they will give amazing polished edges - My scary sharp system tops out at about 1400 grit on the translucent arkansas stone, which gives a great working edge, the WE I can get lapping film at .1 micron or about 250000 grit (yes four zeros), so thats a whole different ball game, is it sharper, yes obviously, will it benefit you? Probably not, even scalpels are only ground to 400 grit, but it will look super. The idea is that you use just one side to work up a burr, then both sides alternately to remove the burr and keep sharpening, you can get quite a nice, fast pace going after a while, as you start to build up muscle memory and a neural network forms, but be cautious as the blade gets sharp very quickly. Also an incorrect technique requires roughly 5000 correct movements in a row to unlearn...so saying you can work forwards, backwards, up and down, there seems to be quite bit you can do with them, you do need to be careful not to round the tip off though, also you do not need to apply and force, just the weight of the paddles does the work. Then its just stroke and repeat - the repeatability and ease or repeatability is the key here, both on the knife you are currently sharpening and on your line up. 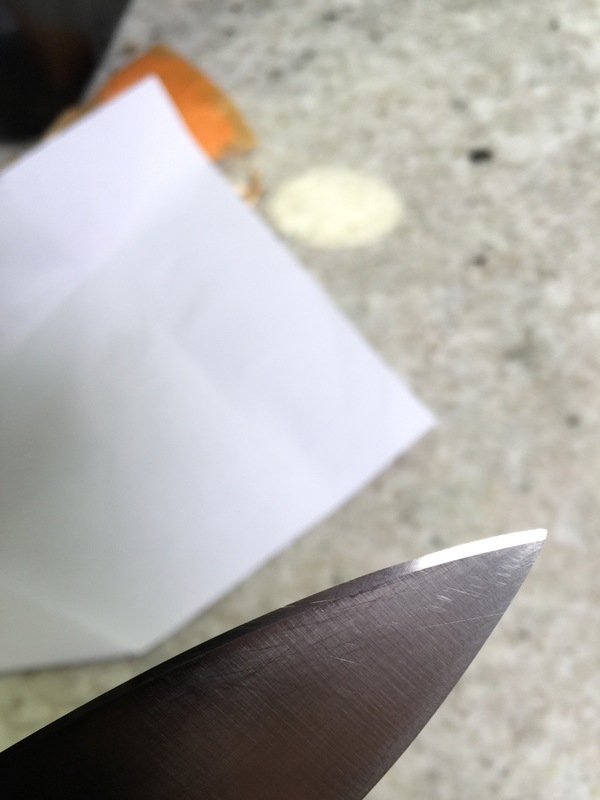 If you take a note (or a cell phone photo) of how your knife was in the vice when you sharpened it then you can replicate the same position and angle next time. So are 200/600 grit paddles all you need? Well probably, if we are talking a normal hunting knife or even a standard kitchen knife then thats probably fine, it will work, do the job, can be stropped until its too far gone then be resharpened at the 600 grit, or if you damage it at the 200 then at the 600 once more to get rid of the biggest scratches. Of course if you want it really insanely sharp you can go higher (as a side note, it has been shown that the sharper the knife that produce before it gets stored somewhere the longer that produce lasts as a sharp knife cuts just the cells it comes into contact with whereas a blunt knife crushes a lot of cells as it makes it was through, try chopping a soft tomato with a sharp knife then a blunt knife and you will get a sense of this). Of course a lot of you are going to say what a waste of money and you just use an oilstone...yup can do, don't get the same results, I can also use a typewriter and I learnt how to take photos and develop film in a dark room, I don't use either of those methods anymore because they are better and easier ways of doing things, same with sharpening knives, I believe diamonds are the way to go, not necessarily the go, but so far I am enjoying mine, of courses it just early days so far, I may change my mind, this is just my first impressions, and at the moment I feel its money well spent! andyanimal31, Rich007, StrikerNZ and 4 others like this. Along with a bit of research you have convinced me. I will likely go the 130. They're out of stock on the 50 unless I can find a retailer with one. I will get it sent to my brother in Vancouver and bring home when I get back in November. I was told about a good Russian system that looks well engineered but I think it would take up too much space and the diamond paddles of the WE would last longer me thinks. I can most likely send you a chamois skin if you are happy to get it tanned etc. The Russian system is the tsprof, it’s very good if a little over engineered, the problem with is is that you can only do one side at a time, although you can very quickly rorate it. The we130 has a better vice than the 50, you can operate it with one hand as opposed to having to tighten it with the Allen key, it also has micro adjustment and the clamp is supposed to clamp evenly as both sides move together. Comes with 100/200 and 400/600 paddles, that will deal with most possibilities. You will neeed to get or make a base for it though, basically a heavy chopping board will do the job, just screw it down and you are good to work. Happy to tan a bit of hide if you happen to come across some! Shouldn't be a problem sorting a base. I would buy some extra paddles and finer stones/diamond. I will pm you when I have a skin. I just had a look and only have a couple headskins or at the moment. I see you bought a cube for angles. Hope I don't piss you off but if you have a good smart phone you can downlowd a clinometer app that gives accurate angles that should suit the purpose. Nah tried the iPhone clinometer on the scary sharp, kept slipping off, the angle cube has magnets all over it so it stays in place, I always measure at the same spot on the paddles and that way get repeatable results. In the us the price is 199usd. Over here they are 350nzd., you won’t get hit by customs (probably) not sure what shipping is though. Also as there is a big demand for them at the moment they are usually sold out, they other models are available though. 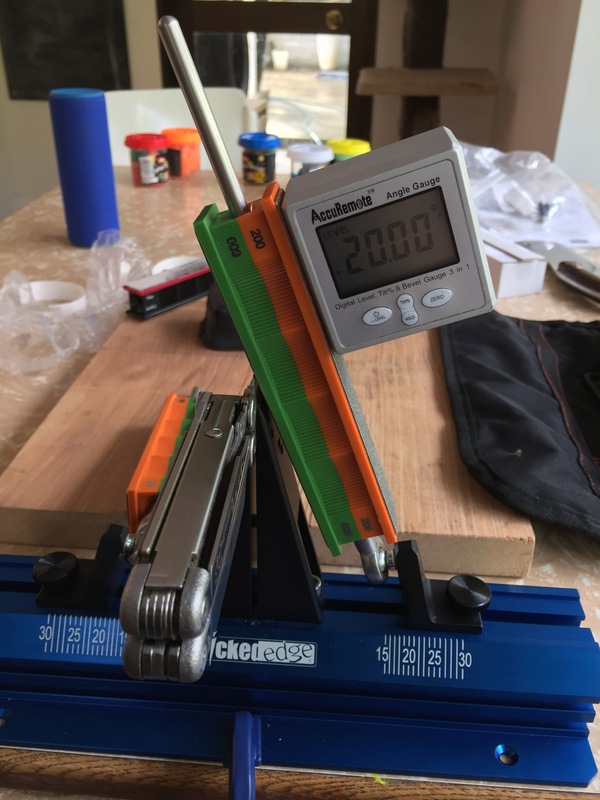 I bought this angle meter as an accessory to my Wicked Edge sharpening system. If you're unfamiliar with the Wicked Edge, it's basically a knife sharpening system that allows you to be very precise with the angles you use when sharpening your knife. The idea here is that with this tool, you can achieve near engineering level precision. When I received this item, it feels like a well made item. All alloy construction, easy to use controls and nice strong magnets. So far, so good. 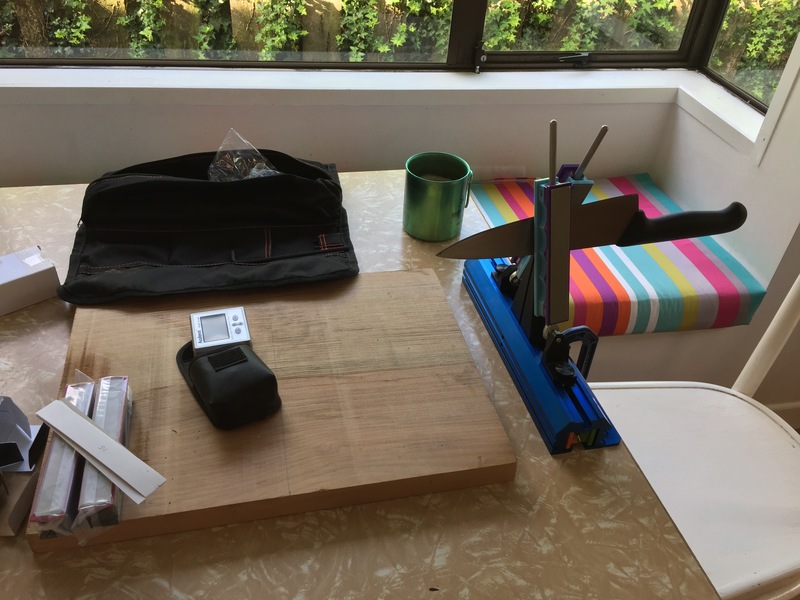 I get my Wicked Edge ready and the way it's setup is on one of those wooden portable tray holders, so I'm sitting in a chair and looking a bit down at the sharpening system. I attached the angle meter to one of the steel rods and hold it up against the edge of the mounted knife to check the angle...What the?!?! I can't make out what the display says, heck I can barely tell if it's even on. So I squat down and have to be looking almost directly straight at it to properly see the digits. Tilting the meter up to view the numbers is a no-no because that skews the reading. Using the backlight doesn't help at all (again, except if you're looking straight at the display, then it does a good job). If you're able to use this meter in a position where you can view it straight-on, then it's a great device, it will do it's job well and I have no problem recommending it. But if you're in a situation like me, then the little extra bit of precision it gives is quickly negated because you have to make the extra effort to read the display properly and to that you might want to look elsewhere. Interesting comment on your angle meter from Amazon. The fitter/turner in me is trying to think of an easy way to make some form of frame/mount of my own with out too much feckin' around. Especially if I can find something to repurpose. Cordite and csmiffy like this. The typical NZ markup- business too small to import or hold a lot of stock to keep the price down so they wack the price up for the ones who don't mind paying or cant be bothered importing it themselves. Even saw it sometimes on automotive parts I was interested in when I was in OZ. If you don't use the clinometer, how does the angle gauge/scale on the sharpener work? From your first photo I can't see any marks on the bases of the guide rods to line up with the scale on the base? If you can make it to Auckland you are welcome to go over mine with a magnifying glass to work out how to make your own! Not on the rods mate, the black bit is moveable, side to the left to reduce angle or to the right to increase angle, then screw to lock in tight with the thumb screw thing (highly technical terms of course), it’s easy to adjust but does take a few seconds to dial in a precise angle, depends how fussy you are. The best knife sharpener by far!